Fashionistas are waiting with bated breath for the upcoming exhibit, The Fashion World of Jean Paul Gaultier: From Sidewalk to the Catwalk, which celebrates 35 years of the designer’s cutting-edge creative genius. The exhibit at the De Young Museum in San Francisco will run from March 24, 2012 to August 19, 2012. A multi-media extravaganza spanning four decades of Gaultier’s work, the exhibit includes 120 ensembles from both his haute couture and prêt-à-porter collections, some of which will be displayed on mannequins with live hologram facial projections. Visitors will be privy to his sketches, stage costumes, concert footage, film excerpts, and photos from greats such as Richard Avedon, Mario Testino, Steven Meisel, and Steven Klein, providing a true sense of Gaultier’s design mastery as well as the success of his collaborations with filmmakers, choreographers, and musicians. The project is led by Montreal Museum of Fine Arts Director and Chief Curator, Nathalie Bondil, whose appreciation for Gaultier is apparent. “Beyond the technical virtuosity resulting from exceptional expertise in the various skills involved in haute couture, an unbridled imagination and ground-breaking artistic collaborations, he offers an open-minded vision of society—a crazy, sensitive, funny, sassy world in which everyone can assert his or her own identity, a world without discrimination, a unique ‘fusion couture.’ Beneath Jean Paul Gaultier’s wit and irreverence lie a true generosity of spirit and a very powerful message for society,” explains Bondil.More of a contemporary art installation than a fashion retrospective, the exhibit is organized by six different thematic sections, ranging from the streets of Paris to the world of science fiction, that mark the couturier’s creative development: The Odyssey of Jean Paul Gaultier, The Boudoir, Skin Deep, Eurostar, Urban Jungle, and Metropolis. 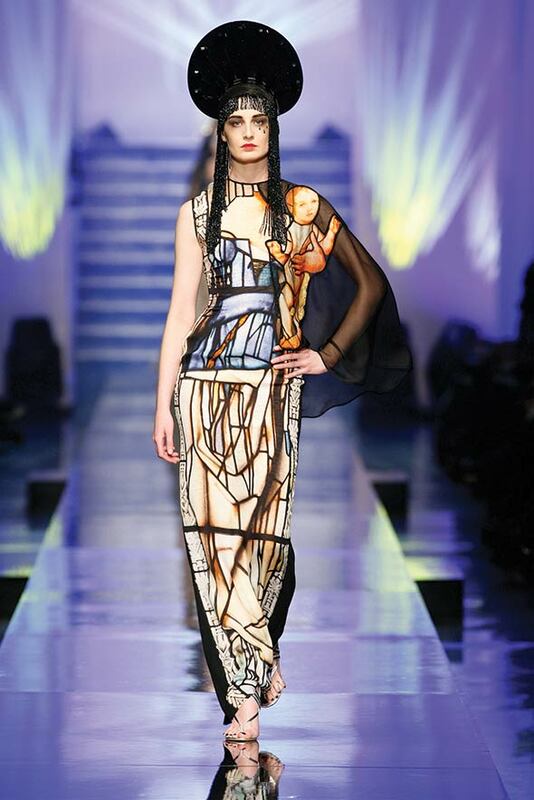 “I liked the idea of a thematic rather than a chronological presentation,” says Gaultier. “It’s more fun, less limiting, more like my world. A chronological staging gives the impression an end has been reached, which isn’t the case, as my fashion house is certainly very active. The themes are corsets, sexuality, the feminine-masculine, and the masculine-feminine, as well as fusions that bring together all of the world’s cultures. The set-up itself is a vast indicator of how Gaultier thinks; while many designers work off trends, he has cast a wider and completely different net for his inspirations.” Fondly nicknamed enfant terrible for his gender-bending radical pieces and memorable celebrity collaborations, including Madonna’s infamous cone bra of the ’90s, the ever-provocative Gaultier has dressed some of the most influential women in the world, including Lady Gaga, Marion Cotillard, Nicole Kidman, Liliane Bettencourt, and Catherine Deneuve. Yet Gaultier consistently backs up the theater of mainstream pop culture with impeccable tailoring and workmanship, garnering the respect of the fashion editorial community. Gaultier’s passion for design emerged in his teenage years, as he began fearlessly sending out sketches to the top houses. When Gaultier was 18, Pierre Cardin and later Jean Patou answered, setting the stage and providing the training that led to his first prêt-à-porter collection in 1976. Gaultier carefully honed his skills, finally launching his critically acclaimed couture collection in 1997—more than two decades later. Gaultier has since played an important role in the sexual revolution by embracing both the feminine and masculine. By incorporating corset gartering underneath a well-tailored suit, he not only surprises, but also empowers. In the world of fashion, which often has very strict rules of who belongs and who does not, Gaultier does not discriminate. On the runway, he is forever playing with androgyny, bending gender rules, challenging ethnic diversity, and sending plus-sized or heavily tattooed and pierced women down the catwalk. Indeed, one of his greatest cultural achievements has been his ability to visually challenge our own belief systems. Gaultier’s gentle smile, mischievous eyes, and humor lighten the sometimes serious subjects he tackles. 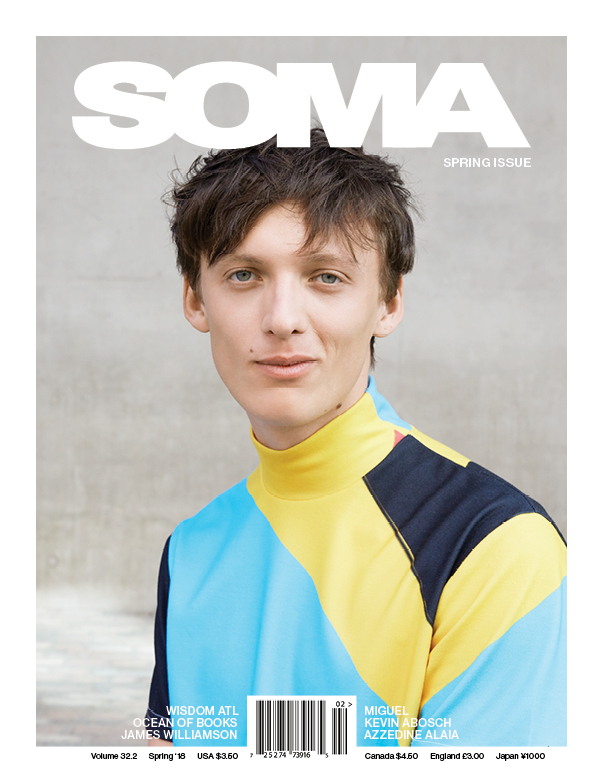 He threads myriad social concepts with utterly masterful tailoring. Whereas many designers are “occasion-driven,” dressing women for the Oscars, for work, or for the beach, Gaultier has always focused on dressing them for the soul—a narrative that has been consistent throughout all his years in fashion. He is never afraid to mix it up, even when it makes us uncomfortable, and in fashion it is this fearlessness that makes him a cut above the rest.